Bromus inermis plants_(3861166514) commons.wikimedia.org (Accessed 11/2017). 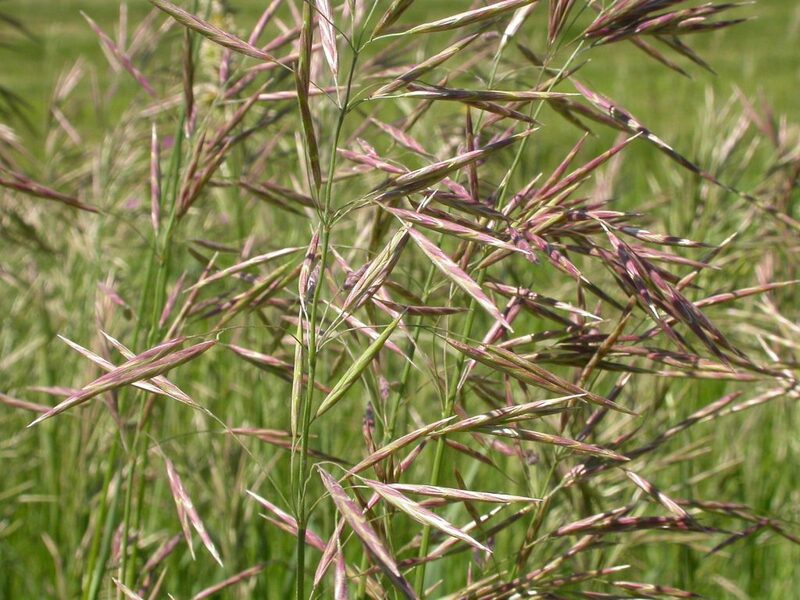 Bromus inermis is a perennial C3 grass (Reich et al. 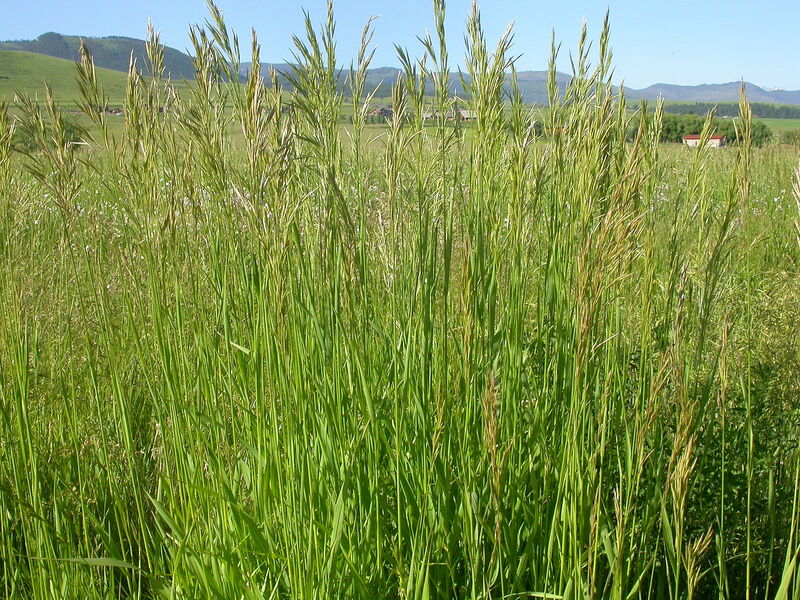 2003), 0.5 to 1 m tall, cool season grass, sod-forming, colonial from rhizomes, plants hairless, except often finely hairy at nodes; sheaths closed near top; ligule to 0.1 cm. 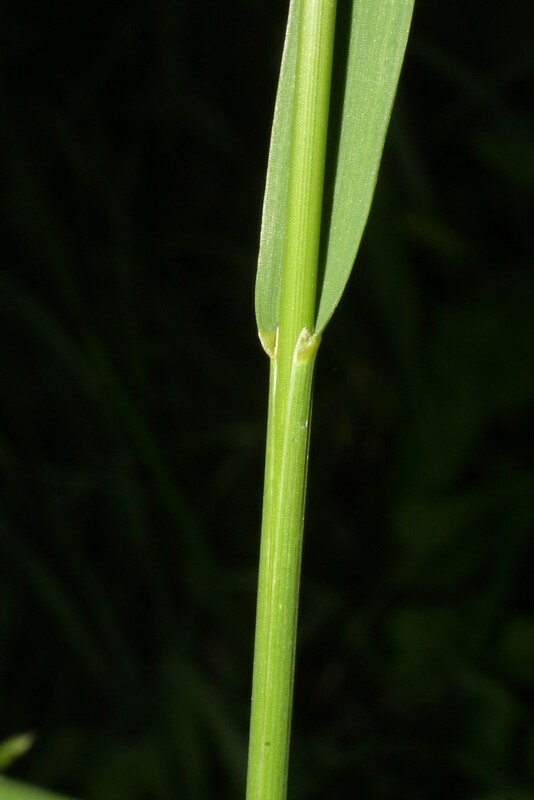 Bromus inermis stem and leaf base. By Steven Baskauf. Copyright © 2017 CC-BY-NC-SA. www.cas.vanderbilt.edu. New England Wild Flower Society. gobotany.newenglandwild.org (Accessed 11/2017). Leaves alternate, blades 0.8-1.5 cm wide, to 30 cm long. Bromus inermis spikelets (not blooming)_(3861164554) commons.wikimedia.org (Accessed 11/2017). Flower spikelets about as long as inflorescence branches, 1.5-3 cm, 7-11 flowered; first glume 0.4-0.8 cm, second to 1cm; lemmas 1-1.2 cm, with little or no awns; self incompatible; inflorescence 10-20 cm long, at first open then contracted, branched, with stiff, open or ascending branches, 4-10 branches per node; blooming and fruiting June-July. Habitat: Roadsides, open areas. Moderately tolerant of salt, tolerant of drought, intolerant of shade. Notes: Seeds eaten by Itonidid midges and Chalcid flies as well as birds and small mammals (Sather, 1995; Martin et al. 1951).